Love 'em! Perfect for my small space. And comfortable to sit on. These gorgeous counter-height stools are made from premium hardwood with a rich espresso brown finish, and supple bonded leather seats. The backless design provides both versatility and comfort, while the curved cushion design is both impressively supportive and remarkably comfortable. These stools are great. We wanted stools for our kitchen island in a small kitchen. We needed backless stools that would fit under the counter overhang and not have legs that stuck out. This particular stool met all of our needs. They are 26 inches tall, instead of the usual 24 in, and are the perfect height for 36 inch high counters. They are backless. The legs are straight and don't flare out so they take up less space. The seats are wide and well padded for comfort. The seats are leather making them much more practical than upholstery for kitchens. The footrest bar is protected with a metal covering so your shoes don't wear off the finish on the wood. Each stool weighs about 22 pounds and construction is very sturdy. I was very happy when they arrived assembled and did not need to be put together. They look beautiful. But within a few DAYS of sitting on them the leather started to sink in and indent and not spring back. My guess is that the padding is not as good as it should be. I am thinking about returning them. I purchased 4 of the Christopher Knight Home Avondale Brown Counter Stools and I'm delighted with them. The picture does not do them justice. The stools are very well made and very comfortable. And they look very expensive. Great Buy! These stools are the perfect height for counter top dining, and look super sharp. The bonded leather looks and feels very high quality. I appreciated the fact these required no assembly and that was one of the reasons I selected them. I recommend these stools if you're looking to purchase some. 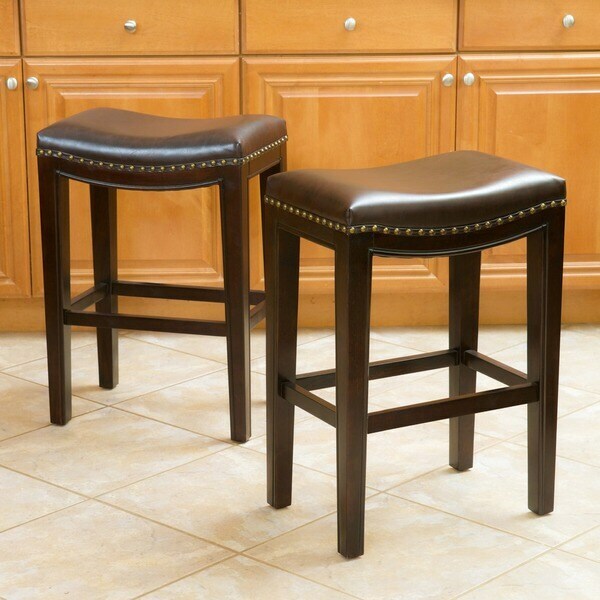 About my Avondale 26-inch Brown Bonded Leather Backless Counter Stools (Set of 2) I liked the price, the height, and the promptness of delivery. They are sturdy. I dislike the width and the firmness of the seat area. They are better suited for children as the seats are narrow and quite firm. Absolutely love these stools. They are exactly what I was looking for. Well made, nice color, comfortable to sit on, perfect size. I was glad I did a little research and ordered the shorter stools (I believe 26 inch height) versus the original 30 inch ones I looked at first. The 26 are perfect for a kitchen counter height; 30 would have left little room for legs and would not have been as comfortable. Those are probably intended for bar height. Overall, very satisfied with purchase and would highly recommend!! Perfect backless, saddle-style counter stool. Very good-looking and nice quality. The nail head trim is a great design element. The seats are wide and comfortable. Stools are solid, not flimsy. Excellent value. Love these, soooo comfortable. I bought two of the 30 inch counter height also. Leather seat it very cushy and comfortable. Would buy again. I love the stools. I had other stools which I returned because they were not sturdy. These stools came assembled and are very sturdy. Perfect height and live the brown leather. Though it's bonded leather doesn't feel cheap at all. It has the plastic knobs so protects my wood. Would buy more. Frames not constructed very well - wood splits / breaks easily. Two of four chairs broke within the first few weeks. We don't recommend these stools. Strong and beautiful bar stools. Color is perfect, and great quailty! I can sit on one and not hurt my Injured tail bone. I loved that they came Fully assembled. Cumfortable, Nicely made, and fit Great for our needs. Super Fast Shipping. Thank You Overstock. Loved that they came completely assembled. Look very nice and sturdy. Received a day earlier than expected. Best part was that came assembled! Perfect fit at my low island. Good sturdy leather and wood. Have had for four months. Holding up very well. Great quality and excellent value. Would highly recommend and would buy again. These are a super great deal. I have a counter top kitchen table and did not want to buy 6 of the ratan chairs that I selected to go with the table. I bought 4 of the ratan chairs and then bought 2 of these stools as add ins when needed. Comfortable and nice looking. Can’t go wrong with these in my book. Super comfortable but the tops are crappy. They easily wrinkle which shouldn’t happen on the top of the stool. Sturdy, great looking, and comfortable. Perfect for the new kitchen island I just put in. Came fully assembled, just unboxed and done. I definitely recommend them. 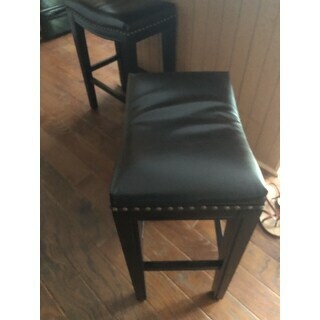 These are good sturdy stools we used them alot and they have held up well and still look good! These are beautiful, sturdy, and were affordable. The BEST part about them is that unlike other stools, you do NOT have to ASSEMBLE them! They came well-packaged and wrapped to keep them from getting scarred. What a value! They are perfect for our space. They are sturdy and the color is true to the picture. My sister is jealous and wants me to give them to her. Of course, I did not tell her where I got them :D Christopher Knight does it right! Sturdy construction. Minimum space required. "Are these REALLY leather because in the photos it looks like some sort of man made material. Thanks." This is a material made with a split leather backing covered with an embossed layer of polyurethane or vinyl. "Hi, can you make it the same style but 24 inch?" "When will this product be back in stock?" These should be back in stock in early May. "Are these sold individually also? I bought this set and I would like one more." "Is the seat actual leather because it looks like imitation leather?" Yes, it is constructed of bonded leather. "Can you confirm the actual height of these stools. Is it 26.25" as noted or shorter. I have found some descriptions of other stools on Various sites to be wrong. Thanks"
That is essentially the correct height - maybe 1/8" inch less. This is accurate! We love these stools! My daughter sits at our breakfast bar and does homework sitting in these chairs every day! As you can see in the picture, there is a dip in the middle of the stool. The height of the edge is 26", but the middle dip is 25". Hope that helps. "Do you have this model/color in Bar height? Thanks!" Hello braga, we appreciate your inquiry. Unfortunately, this color is not available in the bar stool height, however, we do carry the bar stool height in the cream color under item # 15741719. Thank you for shopping with us!